I'd like to thank San over at Informed Sharing for her perceptive review of my blogs. I am not only honoured, but humbled that the information I share at traverselife and the fun I have with words at JumpingAground has been acknowledged so thoughtfully and generously. Thankyou San. Noooooooooooooooo! There’s a naughty nincompoop nodding under the bed, it’s making me scared of the night. I feel nauseous when I see its navel. NASA took a neat photo of it but Nana said it wasn’t nice even though it’s a native of Norway. I prefer nasturtiums; they don’t make noise unlike the nasty nincompoop, Nathan. It goes “Nnrgh Nnrgh” and tries to nip the nape of my neck. * I'm aware that Napalm and Agent Orange are different chemical concoctions, and that Agent Orange was used extensively in Vietnam, whereas Napalm was an earlier era weapon. But I needed a word that started with N. I also wanted to acknowledge the dreadful damage done to our Vietnam Veterans, and the people of Vietnam by its use. **I'm also aware that this drabble doesn't make any sense at all. It's Saturday, we're half way through the challenge. I'm tired. It is what it is. Apologes to all my Norwegian friends - you know I think you're marvellous. East Side Gallery is in Berlin. For some reason today I can't add any more words and keep the formatting. Here tomorrow: Oh darn, I'm stuck for ideas ... it'll be a surprise! Over at traverselife, I'm spending the month looking at different aspects of bullying. this was an enjoyable post. Loads of "N" words! lol Will return for tomorrow's. Nnrgh, Nnrgh, it's like the three stooges said, Nyuk, Nyuk. Yes, we made it halfway and I've noticed, they are dropping off like flies. Monday is O, I opine , I opine, I opine what you'll do with all the O's. Never again was my first thought when I came to 'N'. Oh don't wind me up; I've been thing about'O' all round the golf course today. But you drabbled and that's an accomplishment! That chimney man is certainly hung... *cough* I liked your drabble, even with the liberties taken for alliteration and such. I study pain for a living and those poor folks and their nerve damage... oh yeah... hot mess made with those chemicals. N-credible! Creative and fun! Nice to meet you on the challenge. This is a fun post, with depth too. Well done. Manzanita, yes! the three stooges, I'd forgotten them, good one! Isn't it great to have the Sunday break, whew. Bob, oh deary me. It kind of takes over doesn't it. Good luck! Alex; I did Drabble, but by golly it was great to have a break today! Hope you're enjoying your weekend too. Hart, hehe, trust you to notice ;p Those chemicals are really nasty, and dreadful attempts to cover up. Shameful. YAY! Enjoy the rest of your weekend and I will do the same. San, I'm lagging behind in replying to comments, sorry. No probs about the shouting, I think I need that otherwise I wouldn't hear you at all. And here we are at the middle of the week - Q is next! I feel like the little red engine "I think I can, I think I can..."
L. Lighten up! & A CELEBRATION!!!! D. Distinguished scientists. 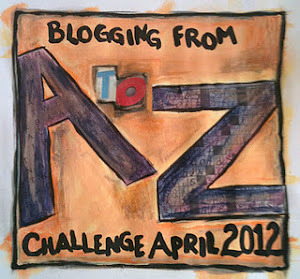 A-Z challenge. C: Climate & Children. 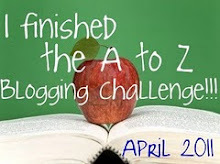 A-Z challenge. B: Bereft of Bananas. 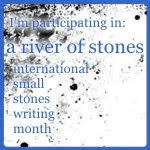 A-Z April challenge.